← What’s the colour of summer? Our potatoes are growing bigger. I checked the net about potatoes. 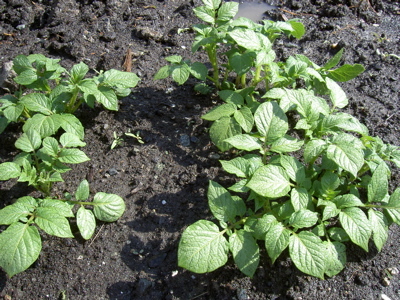 Potatoes came to Japan about 380 years ago to the port city of Nagasaki. Nagasaki was the only place in Japan where international trading was allowed and trade was allowed only with Dutch people. Those potatoes were shipped from Jakarta, Indonesia, so potatoes are called “Jaga-imo” (Jakarta’s root). Potatoes have a lot of vitamin C. Since they were great as a stock of food on ships, potatoes spread around the world during Age of Exploration in the early 17th century. 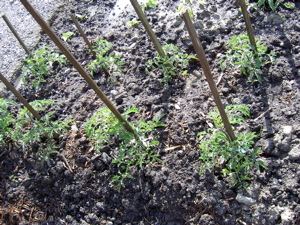 Tomatoes are growing bigger as well. In San　Diego, America, a man snatched a shopping bag, a lady was carring. However, when the man opened the bag, he found a dog turd. The man grew angry, and pointed a gun at the lady and asked for money. Moreover, he shot twice at the dog but the gun did not fire. The man got into a car in hurry and ran away. What a stupid thief, I say.